I have a family stuffing recipe that goes back at least four generations that is unlike any stuffing I have ever had anywhere. It isn't dry. It has a wonderful flavor. The secret ingredient is sausage. Of course, being a classic Italian recipe it's full of gluten. In 2016 I had to stop eating gluten. Not wanting to give up the all-time very best stuffing recipe ever, I spent nearly a month cooking batch after batch of stuffing in search of the PERFECT gluten free substitutes that still captured the taste and texture of my great grandmother's original recipe. I tried Trader Joe's gluten free stuffing mix as well as making my own GF croutons with other gluten free breads and the texture just wasn't right. On the fifth batch, I found the secret to the making the best gluten free stuffing! The secret to the perfect texture in gluten free stuffing is Udi's gluten free HOG DOG BUNS. It's so good that nobody will even know the stuffing is gluten free if you don't tell them! 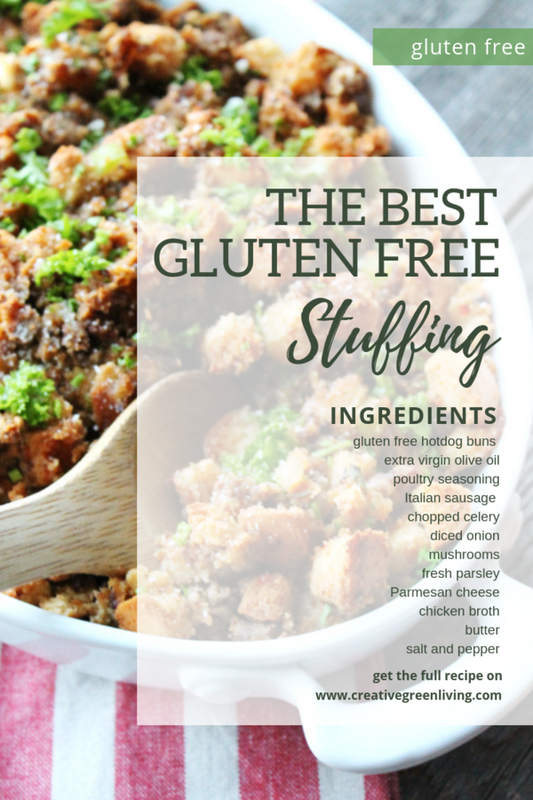 This makes it the perfect stuffing to bring to any Thanksgiving or Christmas gathering where there is a mix of gluten-free and non-gluten-free family members together. Whenever I am invited to Thanksgiving dinner, I always volunteer to bring the stuffing because truly, once you have had this stuffing recipe, you will not want any other stuffing. 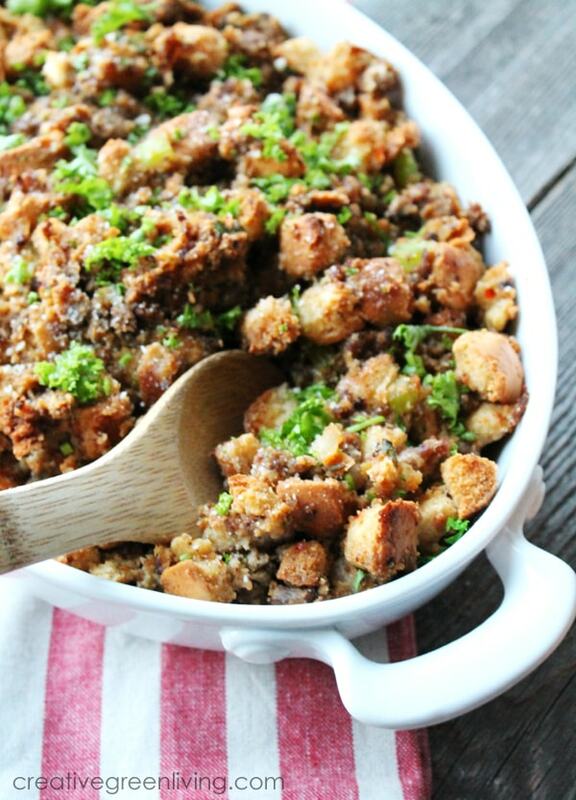 It is honestly the very best stuffing recipe ever - and the fact that I am BEGGED to bring the stuffing with me to subsequent Thanksgiving dinners is a testimony to that! Gluten free cooking tip: As with any gluten-free recipe, your final product will only be as gluten free as your ingredients. Be sure to check that the ingredients you are purchasing are gluten free and use good kitchen sanitazation practices to keep the food from becoming cross contaminated in the kitchen. Cut hot dog buns into bite-sized cubes. Toss in a large bowl with EVOO and 1 tsp poultry seasoning. Spread croutons in a single layer on a large baking sheet (use two if necessary). Bake at 350F for 15-20 minutes until light brown and very dry. Brown sausage in the bottom of a large stockpot over medium heat, stirring often to break into crumbles. Add celery and onion to stockpot, stirring to cook approximately four minutes or until very fragrant. Remove pot from heat and add toasted bread cubes, mushrooms, parsley, Parmesan, 1 tsp poultry seasoning, chicken broth, and melted butter. Stir well to combine. If stuffing seems too dry, add more broth, 2 Tbsp at a time (4 Tbsp max). Season with salt and pepper to taste. Move stuffing to a baking dish. Bake uncovered at 350F for 20 minutes. Remove from oven and serve warm. Alternatively, add the stuffing loosely to the inside of your turkey. Bake until the internal temperature of the stuffing reaches 165. 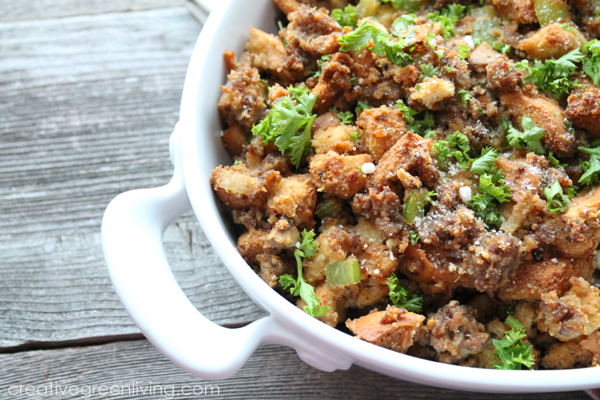 This gluten free stuffing is perfect for stuffing a turkey or just baking on the side as-is. It's a gluten-free spinoff of my grandmother's Italian style dressing with sausage that everyone loves. Brown sausage in the bottom of a large stockpot over medium heat, stirring often to break into crumbles. Add celery and onion to stockpot, stirring to cook approximately four minutes or until very fragrant. Remove pot from heat and add toasted bread cubes, mushrooms, parsley, Parmesan, 1 tsp poultry seasoning, chicken broth and melted butter. Stir well to combine. If stuffing seems too dry, add more broth, 2 Tbsp at a time (4 Tbsp max). Season with salt and pepper to taste. Move stuffing to a baking dish. Bake uncovered at 350F for 20 minutes. Remove from oven and serve warm. 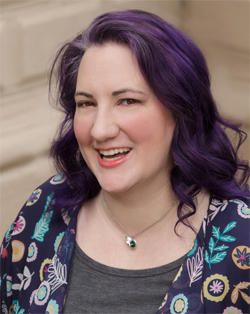 You could alternatively, lightly pack the cavity of a raw turkey and bake until the internal stuffing temperature is 165 F.
She is also the author of the hardcover cookbook, Beautiful Smoothie Bowls (Skyhorse, 2017) and Proven Techniques for Keeping Healthy Chickens (Skyhorse, 2018). Her projects and recipes have been featured in magazines like Kids Crafts 1-2-3, Capper's Farmer and Urban Farm Magazine. Follow her on Pinterest, Instagram, Twitter or join the Creative Green Living community group.